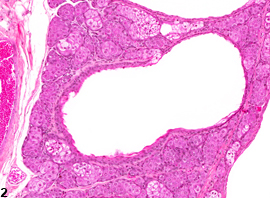 Preputial Gland, Duct - Dilation. Ductular dilation in a male B6C3F1 mouse from a subchronic study. Preputial Gland, Duct - Dilation. Ductular dilation in a male F344/N rat from a chronic study. 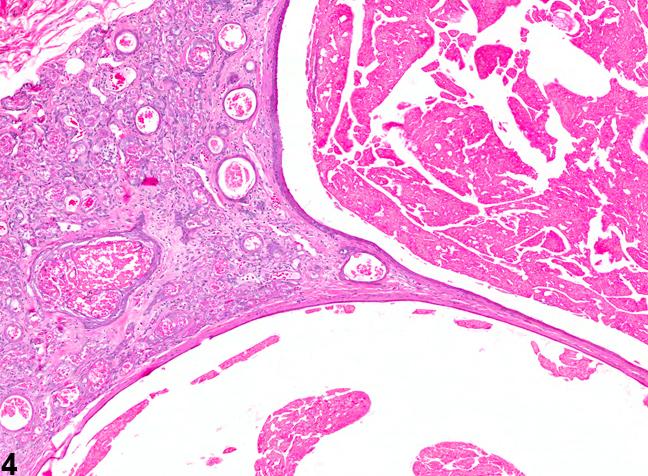 Figure 1 and Figure 2 show several cystic structures; most are lined by flattened epithelium and are dilated ducts. 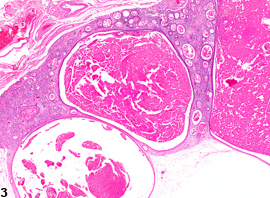 Ductular dilation may be characterized by accumulation of brightly eosinophilic material consistent with keratin and keratin debris ( Figure 3 and Figure 4 ). 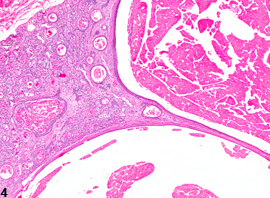 The lining epithelium of dilated ducts is often atrophic. Ductular dilatation increases with age. Cyst and ductular dilatation should be recorded and graded. If both glands are involved, the diagnosis should be qualified as bilateral and the severity grade based on the more severely affected gland. Potential treatment-related effects should be documented in the pathology narrative. Haines DC, Chattopadhyay S, Ward JM. 2001. Pathology of aging B6;129 mice. Toxicol Pathol 29:653-661. Rudmann D, Cardiff R, Chouinard L, Goodman D, Kuttler K, Marxfeld H, Molinolo A, Treumann S, Yoshizawa K. 2012. 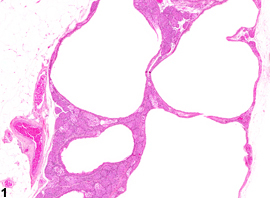 Proliferative and nonproliferative lesions of the rat and mouse mammary, Zymbal's, preputial, and clitoral glands. Toxicol Pathol 40:7S-39S. Seely JC, Boorman GA. 1999. Mammary gland and specialized sebaceous glands. In: Pathology of the Mouse: Reference and Atlas (Maronpot RR, Boorman GA, Gaul BW, eds). Cache River Press, Vienna, IL, 613-635.